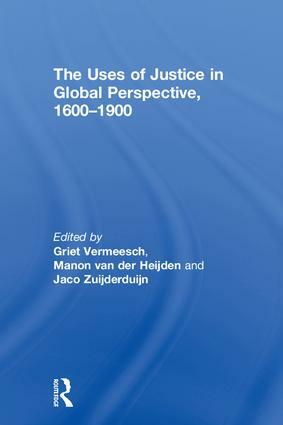 The Uses of Justice in Global Perspective, 1600–1900 presents a new perspective on the uses of justice between 1600 and 1900 and confronts prevailing Eurocentric historiography in its examination of how people of this period made use of the law. Between 1600 and 1900 the towns in Western Europe, the Kingdoms in Eastern Europe, the Empires in Asia and the Colonial States in Asia and the Americas were all characterised by a plurality of legal orders resulting from interactions and negotiations between states, institutions, and people with different backgrounds. Through exploring how justice is used within these different areas of the world, this book offers a broad global perspective, but it also adopts a fresh approach through shifting attention away from states and onto how ordinary people lived with and made use of this ‘legal pluralism’. Containing a wealth of extensively contextualised case studies and contributing to debates on socio-legal history, processes of state formation from below, access to justice, and legal pluralism, The Uses of Justice in Global Perspective, 1600–1900 questions to what degree top-down imposed formal institutions were used and how, and to what degree, bottom-up crafted legal systems were crucial in allowing transactions to happen. It is ideal for students and scholars of early modern justice, crime and legal history. Griet Vermeesch is a fellow of the Research Foundation Flanders at the Vrije Universiteit Brussels, in Belgium. Her research relates to urban history and to access to justice in the Low Countries during the early modern period. Manon van der Heijden is Professor of Urban History at Leiden University and a member of the Academia Europaea. She is author of Women and Crime in Early Modern Holland (2016). Jaco Zuijderduijn is Associate Professor at the Department of Economic History at Lund University, Sweden. His main research interest is the development of economic exchange and conflict resolution. He previously published Medieval Capital Markets: Markets for Renten, State Formation and Private Investment in Holland (1300–1550).